You are here: Home / Marketing / Affiliate Marketing / How Can Affiliate Marketers Build Trust? As an affiliate marketer, trust is not something that you can build overnight but if you are not careful about the products you are recommending, you can lose trust overnight. In any business building trust takes time. At times you can be tempted to make quick money but if it is at the cost of your trust, always avoid it and affiliate marketing is no different. Let me share with you a couple of stories that has happened with me for the products I recommended in the past. 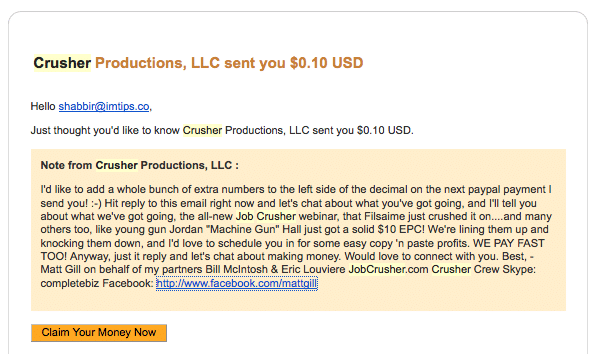 The product was JobCrusher which I promoted on my blog with a nice insiders review. I recommended it because I really liked the content it was there and as I was making decent sales for the product. As a customer I realized there is not much value being added and a lot of information that was being added was crap. Slowly but surely it became more of a spam. Soon things got spammy and I stopped opening their emails as an affiliate. It went to a level where they paid $0.10 (10 cents) to spam me and open their email. You always open an email from PayPal saying you got money. I not only stopped it as a customer but also took my article link down from my blog as well. Before I took my review down, I was making decent amount of money but it was not something I was willing to trade for my readers’ trust. I am not sure if I have generated a single people’s trust removing it and it does not matter but what matters to me is if a single person asks me, do you actually suggest that product Shabbir and will I be able to answer as YES. If I cannot, it should be taken down. I lost ranking for the article as well as sales that were being generated from that article but I think it has helped me be loyal to my readers as it is all about my readers and not about me. Similarly once a very good product vBulletin is a complete crap now and so I don’t recommend it anymore. I was a fan of vBulletin for forums for a few years but when I was not confident about the product moving forward, I started recommending Xenforo. Infact xenforo does not have any affiliate program but vBulletin still has, but I recommend Xenforo over vBulletin. Similar things can be said about each and every product that I recommend and endorse. The reason for a recommendation is not the commission that the product would pay me but because I think it is useful to my readers. You can build trust by only recommending products that you are sure about and are constantly using it as a customer. So if the quality of the product goes down, you are aware of it and can take needed action to let your readers know about the same. In the world of affiliate marketing, it is very easy to lose trust but takes ages to build it. Don’t try to trick readers for quick money as it will not take you much far.